Honda hasn’t had a bad year. 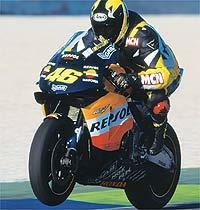 Its bikes have powered exquisitely talented riders to both the MotoGP and WSB titles. In the latest MCN, out November 12, we answer the burning question: What are Valentino Rossi’s RCV and Colin Edwards SP-2 like to ride? MCN’s Trevor Franklin is the man with the answers.
" Rossi’s RCV is like nothing else I’ve ridden…Power and torque are delivered in equal measures – that is the RCV drives from minuscule revs with bags of torque and with almost imperceptible power pulses.
" The chassis is seemingly flawless – nothing compares. Steering is very neutral and the feed back is absolute. " And the SP-2? " Devastatingly fast without feeling overstressed " . You can read more on Franklin’s amazing day with Honda, and how he went faster than Alex Barros on the Brazilian’s own NSR500 in the latest issue of MCN, out Wednesday November 13.